SayWhatNews: Hello Trice, thanks so much for sitting down and speaking with SayWhatNews. Tell us who is Trice Hickman? Trice: Well, first, let me say thank you so much for this wonderful opportunity to connect with the readers of SayWhatNews! I appreciate it! Now…a little about me…I’m a southern girl through and through (by way of eastern North Carolina). I love reading, writing, cooking, working on home improvement projects, participating in politics and community activism, and of course, my all-time favorite sport, shopping! SayWhatNews: A multi-diverse woman with a lot of interest…I like it! Let’s just jump right into it. What inspired you to write your first novel “Unexpected Interruptions”? Trice: When I set out to write Unexpected Interruptions, I wanted to present a story that explored the platonic, best-friend relationship between a young black man and a young black woman because it’s a story we seldom see in books, television or movies. I was inspired to write the book because of my own personal experience of having a male best friend. However, once I started writing the book, the characters took on a life of their own and the story turned into something very different. There is still the wonderful relationship between Victoria and Tyler, who are best friends, but it’s not the main arc of the novel. SayWhatNews: Trice tell us a little more about “Unexpected Interruptions” and its main character Victoria Small. Trice: “Unexpected Interruptions” is a book that deals with complex issues such as race, interracial dating, class stratification, and skin color bias in the black community. The story follows the journey of Victoria Small, a young black woman who becomes involved with two men—one black, one white, both determined in their pursuit for her affections. As Victoria’s relationship heats up with both men she resurrects a painful secret from her past and finds herself doing things she never thought she’d do. SayWhatNews: Mmm…, you have me hooked. So, why did you decide to write about the social issues of dating and dealing with bi-racial relationships? Trice: You know, it’s interesting because I didn’t set out to write a novel involving an interracial storyline. But as the characters began to develop and I saw the direction in which they were headed, I decided to follow them. And I’m so glad I did because the story is so rich and complex because of the added conflict. SayWhatNews: Yes it is very complex and a very interesting and entertaining read. Trice, you have said that you have always been in love with reading. How did you come to write stories reflecting the experience of the everyday African American female and relationships? Trice: When I think about developing story-lines for my books, I’m automatically drawn to topics that I’m familiar with, or that I’d like to read about (since I’m an avid reader!). So writing about social issues like race and class, and emotional dilemmas involving love and family are things that really resonate for me. SayWhatNews: Tell us about how you over came writers block and started writing “Unexpected Interruptions”? Trice” Honestly, it was God, pure and simple. I had reached a very challenging point in my life. I was recovering from a major surgery and I had just been laid off my job. I was at a crossroads and wasn’t really sure of what my next move was going to be. I was so low that I released all my fears, and once I did I prayed and asked God to guide me in the direction of fulfillment. I had been afraid to write because in the past I’d always get stuck. But one morning I sat at my computer and the words poured out of me. I wrote all day and all night, and by 1:00 a.m. the next morning I had written thirty pages, and the first chapter of Unexpected Interruptions was born! God is good! SayWhatNews: Very inspirational. You know its amazing how God can come in and guide us through the darkest hour. Trice, you are your own publisher. Why did you decide to start your own publishing company Platinum Books? Trice: I decided to start my own publishing company for two reasons. The first reason was because I couldn’t find a literary agent or publishing company who were interested in my book. Despite the rejection, I believed in my work and the story that I’d created. I had one hundred percent confidence that if my book was on the shelves, readers would buy it. So, I did my research, planned carefully, formed my company, and published the book myself. The second reason I established the company instead of just producing the book under my name was because I wanted my book to compete alongside any other published book on the market; in the areas of production, quality, style, and content. Plus, I plan to publish other authors down the road and having an established company and brand is very important for that next step. 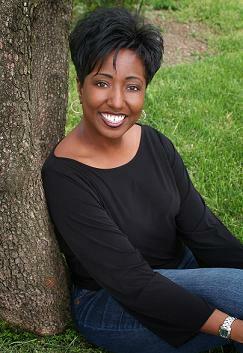 SayWhatNews: So Trice, how do you balance it all: the writing, marketing, promoting your own books? Trice: That’s a very good question. It’s really difficult at times, especially as I publish more titles. I’ve found that having a good plan helps. I develop a time-line that I follow which keeps me on track. But sometimes, even that doesn’t work and I have to make adjustments when necessary. SayWhatNews: Yes, using a time-line makes a lot of sense. “Unexpected Interruptions” won the 2008 Afr’ Am Literary Award for Best New African American Voice and Best Romance Novel Award at the 2008 African American Literary Award Show. How surreal was that experience for you? Trice: It was humbling. I was nominated in a category with some very talented and well-established authors, so to win that award was as you say, “surreal.” I thank God for all his blessings! SayWhatNews: Trice you are a member of several book clubs. Do book clubs play a big role in promoting your book? Tell us how it has helped you market your books. Trice: Book clubs are the lifeline of an author’s career. They are literary ambassadors who promote literacy and in many cases, volunteerism in their communities. Book clubs support authors and spread the word about our books. I helped co-found a book club when I lived in Texas several years ago, and it was a gratifying experience. I participate in on-line book clubs but I haven’t been able to attend local book club meetings because of my travel and writing schedule. Still, when I can, I make myself available to meet with book clubs and discuss my books. I really enjoy that! SayWhatNews: How did you end up using book clubs as a promoting tool for your self published books? Trice: I’ve always been an avid reader so I understood the importance of book clubs. In 2005, before I was published, I attended the National Book Club Conference and that event was the start of my literary career! I connected with book clubs from across the country and got their contact information. They told me that they would support me once my book was published…two years later they kept their promise and purchased my book, and not only that, they helped to spread the word! SayWhatNews: Trice, besides using book clubs as one of your marketing tools what other things do you use to promote your books? Trice: I use other forms of marketing such as public appearances, networking through social media, internet marketing, and good old-fashioned grass roots face-to-face promoting. 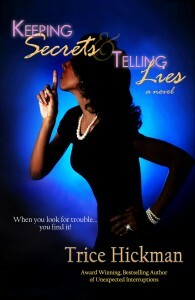 SayWhatNews: Lets talk about your second novel “ Keeping Secrets & Telling Lies”. Tell us about this romance story. Trice: Keeping Secrets & Telling Lies is the sequel to Unexpected Interruptions. It picks up six years down the road in the lives of the main characters. Victoria is married now, and she and her husband begin to keep secrets from each other which eventually results in them telling lies to cover the things they’re hiding. It’s a story about how good people can make bad decisions, and once they do, how do they recover from it. SayWhatNews: Sounds intriguing, I will have to make sure I pick that one up. 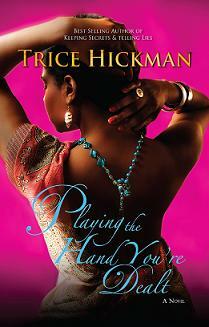 Now, your third novel “Playing The Hand You’re Dealt” is due to be released in August. What can readers expect to get from reading your new book? Trice: This new book is so powerful, and I’m really excited about it. As with my two previous novels, readers can expect a thought-provoking storyline, interesting characters, and lots of suspense and drama. Playing the Hand You’re Dealt centers around the story of Emily and Samantha, two women who are as different as catfish and caviar, yet they share a bond that ties them closer than blood sisters. But their long-standing friendship is tested when one friend sleeps with the other friend’s father! This story examines the redemptive power of forgiveness. SayWhatNews: Wow, this sounds even more scrumptious than the second novel. What was the inspiration for “Playing The Hand You’re Dealt”? Trice: This was a storyline that I came up with a few years ago, and the inspiration came from thinking about issues of love and betrayal in relationships. You always hear about the friend who slept with her best friend’s boyfriend, fiancé, husband, etc. But I thought, hmmm…what would happen if the man who your friend slept with was your father? It’s still a man you love, but in a very different way. SayWhatNews: Ooooh…that’s a tough one to swallow. Your Father is blood and always will be in your life in some shape or form but the boyfriend or husband can be labeled ex’s and forgotten as long as there are no kids involved. Trice, as an self published writer what advice would you give an aspiring writer who is struggling and experiencing writers block? Trice: First and foremost, don’t give up! You have to keep trying, even when it seems as if you can’t do it. You might have to step away for a while, read other books, or talk to other writers to get the juices flowing. Also, get into the habit of writing something every day, even if it’s just a sentence or two. I wish I had done that early on in my career because I believe it would have made a difference. But the most important element in overcoming writer’s block is to never give up. SayWhatNews: And what advice would you give an aspiring writer in the new times of the internet, blogs, social media and etc? Trice: That’s an excellent question and you’re right on point with asking! Technology has changed the face of how we live and do business. Every aspiring author should know that Google is their friend, and Facebook and Twitter are their buddies! These mediums and social networks can connect authors with their key audience. Blogs are very useful in establishing your brand, and when you set up a book tour remember to do a blog tour as well! SayWhatNews: What is next for Trice Hickman?